I just got home from work, and I’m beat. I’ve been looking at Excel spreadsheets all day, coding surveys and thinking of how to analyze them. I will not be going to the gym as planned. I will be looking for leftovers to heat up so I don’t have to think. Thankfully there is no derby practice tonight. I just want to put on my pajama-jams and zone out while watching a History Channel documentary of The Dark Ages on Netflix. But first, the stressed-out hormones in me are calling for tasty carbohydrate comfort on this soon-to-be-44-degree night. Since the gym is a no-go, so are French fries. Luckily there are a few things that are go-to dishes for me that feel much more decadent than they are to make. Roasted veggies are one of those things. 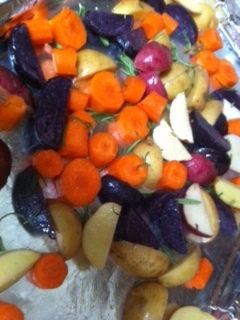 I’ll roast anything, especially veggies if it means that I’ll eat them! 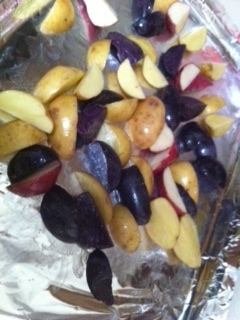 I happen to have those cute little multicolored potatoes that cost far too much for me to buy any other time aside from BOGO. To make me feel a little healthier still, I happen to have some carrots that haven’t made their way into a soup. Roasted carrots are my favorite way to eat them. Their natural sugars caramelize and leave a totally different flavor profile from raw or steamed, both of which I’m not a big fan of. Oh, look. See how much healthier that just got? 2. Cut up your veggies into uniform chunks, about ½ inch by ½ inch. This will make sure everything cooks at about the same time. 3. Pile your veggies into the center of your lined sheet pan and drizzle with olive oil. Sprinkle liberally with salt and pepper. If you’re using fresh rosemary, mince it up and add them. If you’re using dried be sure to go a little lighter (dried herbs have more concentrated flavor) and be sure to pinch as you sprinkle to release the flavor. Roll everything around so it gets nicely coated, and spread your veggies out into an even layer. 4. Bake for 25 minutes until everything is fork-tender and crispy on the outside! If it needs a little longer (some ovens do) then give it another 5-10 minutes until it’s done to your liking. 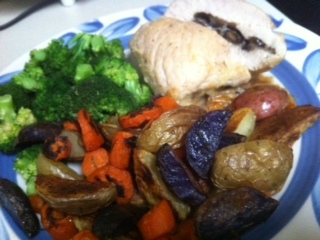 Chicken stuffed with mushrooms from the store, steamed broccoli and roasted potatoes and carrots!